TP Impex limited is the pioneer manufacturer and trader of power products in India. We TP Impex limited (Total Perfection) feel immense pleasure in introducing our vast range of power product in DSP based pure sine wave products like Inverter / static UPS / high capacity Inverter / solar inverter etc. BRINGS LIFE TO ABSOLUTELY DEEP DISCHARGE BATTERIES ZERO VOLT PICK-UP : Now nothing can be as smart as Total Perfection Signature Inverter to get started with deep discharge (Zero Volt) batteries. With Signature around, you need not worry just plug in Signature to your battery and enjoy instant charging. MAXIMUM CHARGING POWER RANGE : Total Perfection Signature Inverter works in any village, any town or any region in India. A charging range of 100V to 300V and a charging of 12 A even on 120V makes Total Perfection the super charging inverter. ANY BATTERY FIT : Total Perfection Signature Inverter works with any battery, Branded-Non Branded, Tubular-Flat plate, Normal-SMF and charges them to their optimum capacity. Its GPM technology takes care of any battery-be it new or old. GPM keeps your battery fit for full life and also makes them a working wonder. AUTOMATIC CHARGING SELECTION TECHNOLOGY : Total Perfection Signature Inverter Micro Controller understands power cut situations and decides optimum charging cut-off and charging current for your battery. More power cuts means more charging-less power cuts means lesser charging. Now charging as per the power cuts-Freedom from charging switch. TOTAL PERFECTION MEANS HEALTHIER LONG LIVING BATTERIES : Total Perfection Signature Inverter takes care of the first charging of batteries same as the care given to a new born baby. It reduces battery sulphation, increases the speed of ion inside, removes stratification and builds up strong gravity for your battery making them stronger, healthier, long lasting giving full back-up. 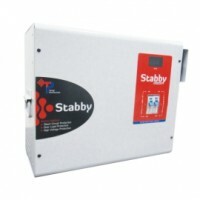 TOTAL PROTECTION ASSURED : Total Perfection Signature Inverter promises complete protection from battery burst and blast. It protects from running of high current in situation of short circuit in Thyristor. The ultra-modern technology in-built in Total Perfection Signature Inverter assures protection in double phase, short circuit, phase reversal and sudden AC back feed. SUPER STYLING : Total Perfection Signature Inverter not only exceeds in performance but also stands out with its super style. Its high quality paint, sleek contours and design add up to your home décor. Its touch button based interactive panel gives it an unbeatable international feel and looks. Total Perfection Signature Green Mode feature switches off your inverter in situation of no load within 10 hours in backup mode. Normal Inverter trickle charges your batteries even after full recharge whereas signature does oscillation charging after optimum recharge giving you a saving of 75% power. The Inbuilt cooling fan inside keeps it cool and enhance performance. Signature’s high frequency technology prevents computer rebooting saving you from the perils of data loss. Signature can run ½ hp pump on 875VA, 12V and above models. The most technologically advanced signature charging not only reduces power bill but also makes battery life double now this is called a Super Saver Inverter. Micro Computer based design ensures high reliability ruggedness. “SIGNATURE” chargi..